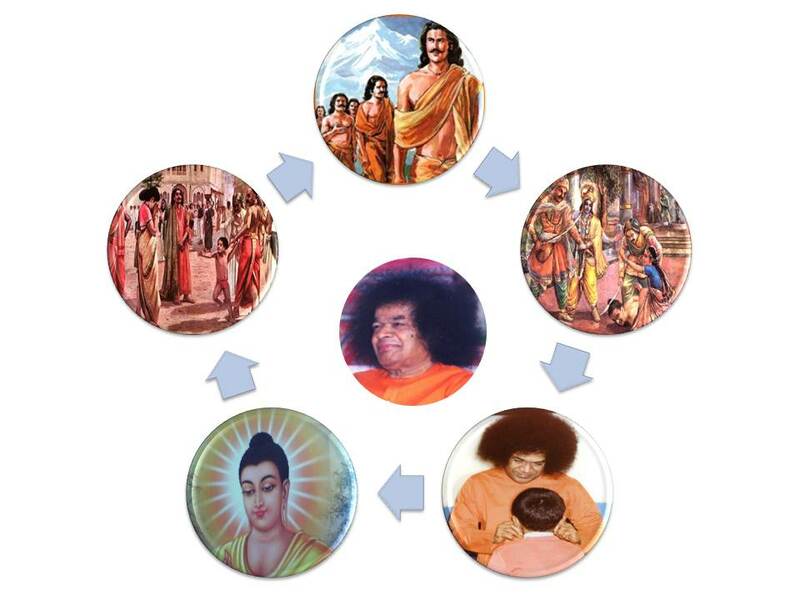 Bhagawan Baba, in all His Discourses throughout His earthly sojourn, has propagated and stressed on the practice of the five fundamental Human Values as the basis of all worldly and spiritual pursuits. 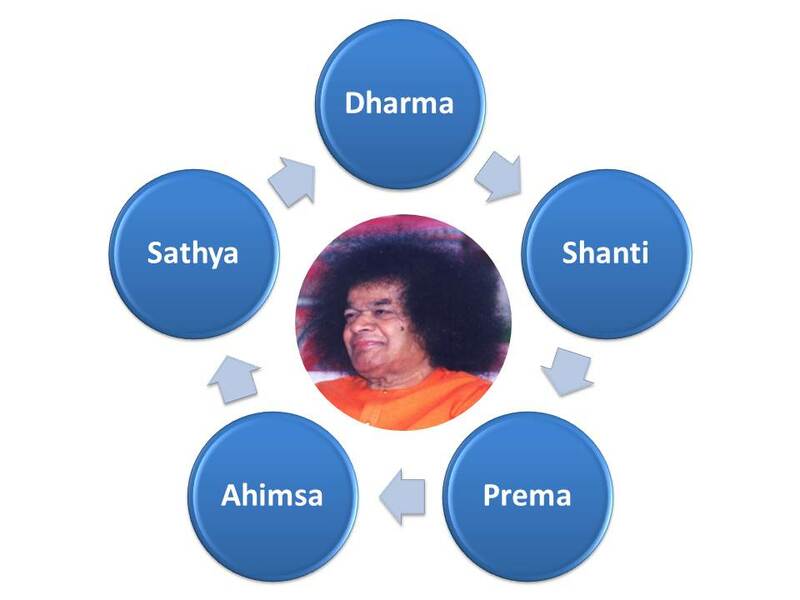 These are Sathya (Truth), Dharma (Righteousness), Shanti (Peace), Prema (Divine Love) and Ahimsa (Non-violence). These fundamental Human Values manifest themselves in our life through a number of instrumental values. Understanding each one of these Human Values demands tremendous effort, time, experience and maturity. As Bhagawan Baba says, life is the best teacher and nature is the best preacher. As we move along the journey of our life, these values unfold their true meaning and purport to us, provided we make a serious and sincere attempt to understand, appreciate and above all, put them into practice in our day to day life. However, an easier way of understanding and appreciating their meaning is to study the lives of great heroes / heroines who have actually lived and demonstrated these values in their lives. This posting is an attempt in that direction. There are many such great personalities embodying these Human Values spread across the length and breadth of our globe. However, the focus in this posting, which is just a sample, is on the rich and sacred epics and texts of the East. In Bharath, the name that goes synonymously with Sathya (Truth) is King Harischandra, popularly known as Sathya Harischandra. Yudhisthira, the eldest brother among the Pandavas was verily called Dharmaja, because of his strict adherence to Dharma (righteousness) in life. Shanti or forbearance was embodied by Draupadi, the consort of the Pandavas. Bhagawan narrates a possibly less known anecdote in the life of Draupadi, where she has demonstrated the forbearance of the highest order, an ideal for all people to follow. Ahimsa was verily the life-breath of Lord Buddha and the very centre-point of his message to humanity. Finally, Love crystallized in a human form and walking on two feet is none other than our beloved Bhagawan Baba. The five audio extracts in this posting have been taken from the Discourses delivered by Bhagawan in the years 1984, 1996 and 2000. There is one extract from a Discourse delivered in the year 1966, for which the audio version is not available. Clip-1 focuses on the value of Truth, through the example of the life of Sathya Harischandra. In Clip-2 Bhagawan narrates a unique episode from the life of the Pandavas, wherein Dharmaja manifests equanimity of a high order and at the same time fulfils all his duties as per his Dharma. In Clip-3 Bhagawan highlights a very special episode in the life of Draupadi that sets an example of the quality of peace in the form of forbearance, for the entire world to emulate. As it would be apt to end the posting with Bhagawan’s life story, we cover Non-violence first and then Love. Clip-4 focuses on Non-violence and narrates a wonderful story from the life of Lord Buddha that is pregnant with profound wisdom and insights. Finally, Clip-5 presents one of those many episodes in the life of Bhagawan Baba, where He has showered His immense Love and Grace on His devotees. Rama is the very embodiment of Truth. But we utter all lies. We perform the Satyanarayana Vratam once a year; that is all. That is not right. Satatam Satyam. We must speak the truth always. Sarvada Sarvakaleshu Sarvatra Harichintanam. We must think of God always, at all times and everywhere. We must at least make an effort to speak the truth. But we are not doing that. The moment we open our mouth, it is lies. Whatever we say, it is lies. It is not even possible to know what the truth is. Therefore students, do not give up truth under any circumstances, even if it comes to losing your very life. It is truth that will be with you, around you, front of you, behind you and will protect you like the eyelid of the eye. This is how Harischandra got transformed into Sathya Harischandra. He was challenged with so many difficulties and pains. He sold his wife and children; he sacrificed his kingdom, and finally became a cemetery worker. But he did not get shaken and he never gave up the truth. Finally, God Himself had to submit to him. God manifested before him, gave him back everything that he had lost and honoured him with the tile “Sathya Harischandra”. Forty-two years after the (Kurukshetra) war, Arjuna was returning from Dwaraka. In what situation was he returning? The entire clan of Yadavas was embroiled in squabble, as a result of which Krishna had left His mortal coil, and Balarama and the Yadavas all perished. Knowing that Arjuna is coming, Kunti got up and sat down. No one has ever suffered as much as the Pandavas did. Since they experienced so many difficulties, they were able to stay so close to God. Kunti got up and awaited the arrival of Arjuna. Dharmaja went forward and received Arjuna. He asked, “Arjuna, how is our Krishna? Our friend, our brother-in-law, our relative; how is He?” Arjuna could not utter any words. “Krishna is no more!”, saying so, Arjuna collapsed. Hearing this news, Dharmaja went to his mother and said, “Mother, Krishna has passed away”. “Did Krishna pass away? Did Krishna pass away?”, she uttered thus thrice and gave up her life. The body (of Kunti) that gave up its life, fell on the lap of Dharmaja. Holding mother Kunti who fell into his lap, Dharmaja was enquiring, “Mother, as Krishna has gone away, have you also gone to find Him? It appears to me that you have gone in search of Him. What for this life without Krishna? So long we have lived with Krishna, we have experienced Him, we have been victorious; we have been able to achieve all this only because of the help of Krishna”. Saying so, he called Bhima and Arjuna. He also called for Nakula and Sahadeva. He told Nakula and Sahadeva, “Start making preparations for our onward journey”. He called Bhima and told him, “Make preparations at the cemetery for the final rites of Mother (Kunti)”. He called Arjuna and asked him to organize the coronation of the young one (his grandson Parikshit). How strange is this? On one side is the death of Kunti Devi, and she was being taken to the crematorium. 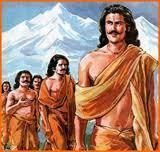 On the other hand, arrangements were being made (for the Pandavas) to proceed to the forest. Yet, on the other hand, all were getting ready to coronate the young one (Parikshit). All these three events happened on the same day. Who can do this? No one can do this. Only devotees who have earned the Grace of God can accomplish such a task. Dharmaja alone could perform such a sacred task. Devoid of all ill feelings. And in the darkness of night slaughter them? Who was also your father and guru. That what you did was right? Is trying to reason with him! Or dealt with as he deserves? “You should not kill Aswathama, for he is your preceptor’s son. Just shave his head as a token punishment and set him free.” This is how Draupadi reacted to the situation; she did not show the slightest anger towards the one who mercilessly wiped out all her children. Once upon a time Buddha set out to seek alms. He neared the village that he was supposed to go to. 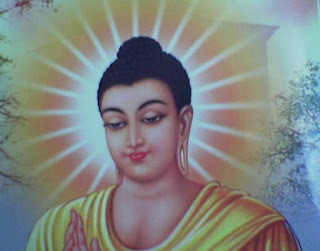 All the residents of that village had great faith in Buddha. However, as he reached close to the village, some rowdies (ruffians), taking to the wrong path, started abusing him in all ways. Instead of travelling further, Buddha sat there on a rock. He asked (the ruffians), “Children, what is the pleasure that you get in abusing me?” Not giving any reply to him, they started abusing him in a more heinous manner. Buddha sat there stating that they could abuse him as long as they wanted. They got exhausted by abusing him continuously and finally they were preparing to leave the place. As they were about to leave the place, Buddha addressed them thus, “Children, in the village that is nearby, all the people love me very much. If you would have behaved like this after I reached that village, they would have cut you down to pieces. Therefore, to make you escape that danger and to give you an opportunity to abuse me as long as you want, I sat here all this while”. In order to make others happy, we have to put in lot of effort and spend lot of money. But today, it is so comforting to me that without spending even a naya paisa (a former monetary unit of India, the 100th part of a rupee) and without putting in any effort, I have been able to give so much happiness to so many of you. If you are so happy to abuse me, then am I not responsible for (giving you) that happiness? I have to satisfy you somehow. Therefore, I am happy that I have satisfied you. To make others happy, there are many who build choultries, dig wells and perform several other tasks to help others. But without putting in any such effort, in this unique way, I have been able to make you wicked people so happy. This amounts to accomplishment of such a great task by me. Buddha taught them one more lesson in a manner that made a great impact on their heart. Children, (let us say) a beggar comes to your house. He asks for alms – Bhavati Bhikshaandehi. You get some alms. But it is not the alms sought by the beggar. You have brought some other alms. The beggar asks, “What would you do if I do not accept the alms?” Your reply would be, “If you do not take the alms, I will take it back with me. It will belong to me only”. In the same way, you all made an attempt to offer me the alms of abuses. I did not accept that. Then, whom will these alms reach? Redirect – it will reach back to you only. Therefore, you all are abusing yourselves and not me. If we post a registered letter to a friend, and if the friend does not accept the registered post, what would happen to that cover in the post office? It will be redirected and will reach the person who has sent it. In the same manner, if you have abused somebody, or if you have criticized somebody, and if they do not care about it, it will all get redirected to you only. Therefore, hatred and jealousy actually hurt you only. To think that it causes harm to others amounts to mean satisfaction. Many of you are pained by the calumny that some papers are indulging in, regarding Me. Many are urging that something should be done about it. But, I am holding every one back, for that is the best way to deal with both praise and blame. The ocean knows no overflowing or drying up. It is ever full, ever majestic, ever unconcerned. A small example. Though I do not want to remind you about this, but even a small boy, having given a promise to Swami, has been keeping up his promise to this day. The boy who spoke first, hails from Simla. I am seeing that boy now. He was so young ten years back. He was studying in Primary School. This and the other boy are brothers. From Himachal Pradesh, the mother (of these children) was brought on a stretcher. They brought her to Brindavan. I took these two boys close to me and told the mother, “These are My children. You do not need to have any more anxiety. Do not worry about your children”. The mother also promised Swami, “Here take my children, O Sai Maata, I am offering them to you”. She handed over the sons and gave up her life. I brought these children here, from Brindavan. Then, they were very young. The boy said, “Mother Sai is my true mother. It is not that (physical) mother, but it is this mother who is most important to me”. The father also made a similar promise. Since then, both these children in Prasanthi Nilayam have not shed a single drop of tear. The tender hearts know pretty well the power of the promise given. Once a promise is given and upheld, there will be no sorrow in life. That is surrender. Mother died. The father too does not come here frequently. He has left them as Swami is taking care of them. Every morning and evening, I am watching them, talking to them and enquiring about their well-being. The tender hearts have such total faith. Today, that boy spoke about faith so well. His heart is full of such faith. They have never experienced the pain of the absence of their (physical) mother. One day, saying that he is missing his mother, the Warden brought the boy to Me, from the Primary School. She said, “Swami he is not eating any food. He is crying”. At that time, the boy was five years old. He was studying in first standard. I called him, made him very happy, took him to the interview room, gave him a ring, pampered him in so many ways and made him forget his sorrow. From that day onwards he is always smiling and smiling. Thus the hearts of the children are so sacred. The elders today are not able to recognize that sacred love. Love is so sacred. It gives you all the courage and valour. Would these children have survived had it been any other place? No! Because they were with Swami, they could live so well. Swami takes care with the love of a thousand mothers! 01-What is the Sanskrit verse that advises us to think of God always, at all times and everywhere? 02-What were the three entirely independent events that Dharmaja was able to initiate and handle at the same time, with total equanimity? 03-In this age of multitasking, can the three tasks handled by Dharmaja in parallel, be considered as a great challenge? If yes, why? 04-What are the questions raised by Draupadi that testify the unjustified killing of the Upa-pandavas? 05-Draupadi with all her forbearance and wisdom prevents the Pandavas from killing Aswathama. She points out six situations wherein it is not justified to kill a person. What are these six situations? 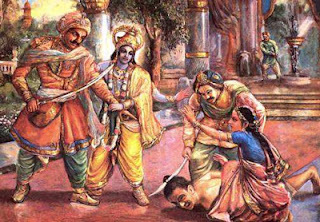 06-Finally what are two reasons Draupadi states to ensure that the Pandavas do not kill Aswathama, the murderer of their children? 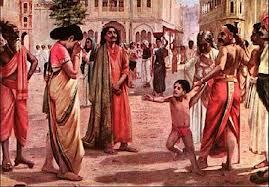 07-Evetually, does Draupadi let Aswathama go scott free? 08-Why does Buddha feel so happy in allowing the wicked people to abuse him continuously? 09-What is the reason that Buddha gives for sitting on the outskirts of the village so long, allowing the wicked people to abuse him? 10-What is the analogy of the beggar and the alms that Buddha gives to explain to the wicked people, as to why he did not react to their abuses? 11-What is the analogy of the guest that Buddha gives to explain to the wicked people, as to why he did not react to their abuses? 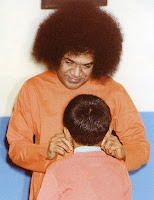 12-Bhagawan says that the tender hearts know the power of the promise given. 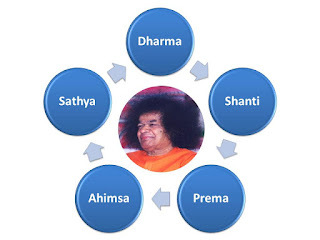 What are three vows or promises that Bhagawan has given mankind as the Avataar of this age?